An eight-try, 57-14 win over Italy yesterday means England could still claim the Guinness Six Nations title, if Ireland can overcome Grand Slam-chasing Wales in Cardiff. Jones’ side will be seeking to reclaim the Calcutta Cup lost in 2018 at Murrayfield, which was followed by unsavoury abuse of the England head coach at a Manchester train station by Scotland supporters. 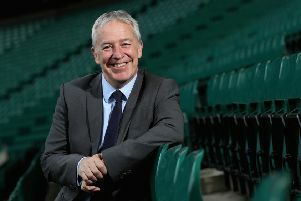 Jones later admitted he no longer felt safe to travel by public transport and felt pre-match comments from Gavin Hastings – the former captain said Scotland would love nothing more than “to rub Eddie Jones’ face in the dirt” – were contributing factors to the disgraceful behaviour. “We’ll rip into training and be at our absolute best next week, because we’re going to have to be to beat Scotland,” Jones said at Twickenham after the rout of Italy. The win last February – 25-13 at Murrayfield – was a surprisingly convincing one for the Scots. Huw Jones grabbed a couple of tries and Sean Maitland also touched down in an impressive first half. It was Scotland’s biggest victory over England in the Six Nations. He was certainly encouraged by what he saw yesterday. Tries by Jamie George, Jonny May, Manu Tuilagi and Brad Shields sealed the bonus point in the 32nd minute to break Ireland’s Guinness Six Nations record for the fastest produced by three minutes. Tuilagi was a marauding presence until his exit in the final quarter and it was fitting that he followed up his first Test try for five years – his last was also against Italy – with a second soon after the interval. Predictably enough, Conor O’Shea’s men were overpowered with Tuilagi supported by the equally devastating Joe Cokanasiga, who set off like a freight train, faded and then finished explosively. George Kruis, Dan Robson and Shields added final-quarter tries and it was a bulldozing run from man of the match Cokanasiga that enabled the replacement scrum-half to cross. It was not until the 62nd minute that Jones decided to field Robson and George Ford and given the result was effectively sealed around the half-hour mark, it once again highlighted the reliance on Owen Farrell and Ben Youngs. For England to now clinch the Six Nations title Wales must fall to Ireland in the final round next Saturday and Scotland must be defeated in a bonus-point win at Twickenham. Italy, meanwhile, will be trying to avoid the wooden spoon when they host France. The unusual sight of Billy Vunipola and Kyle Sinckler finding space with kicks lit up the opening minutes, while on the right wing Cokanasiga sent Azzurri defenders flying with a series of bullocking runs. Italy’s scrum was squeezed into giving a penalty and when England opted for the line-out, they drove over through George in the eighth minute. The scripted start was interrupted when Tommaso Allan slipped between Joe Launchbury and Cokanasiga to wriggle over, ending waves of Azzurri attacks, but the response was swift. Elliot Daly danced into space, evading flailing tackles as he went, and drew full-back Jayden Hayward to provide May with a simple run in. Whereas Daly used footwork to create the opening, it was brute strength that enabled Tuilagi to burst through some feeble defending and complete the race to the line. Tuilagi’s power continued to torment a crumbling Italy side and once again he forced a hole in midfield that created the opportunity for Shields to score under the posts. The deluge of tries carried on in the second half as Tuilagi helped himself to his second after a long pass from George offered clear sight of the line, but the Azzurri were then rewarded for some fine play when Allan sent Luca Morisi over with a pinpoint floating pass. Italy were displaying commendable courage as they came under sustained pressure, but eventually they cracked again when George Kruis charged down a kick, grabbed the ball and fell over the whitewash. Cokanasiga was given his legs on the right wing and he drew his man to give Robson a simple try, before Shields completed the rout with a simple score from close range. It was an impressive way for England to bounce back from their 21-13 loss to Wales in Cardiff two weeks ago. “I don’t think I coached the side very well against Wales and I take responsibility for that,” added Jones at full-time.